Hah, wondered which other knowledgeable WIS was bidding against me. I only upped my bid when I spotted another example come up on ebay with a BIN of $300 and decided I wasn't waiting another 6 months to see one on ebay. Hello teacher, I shrugged my hand, I pushed for a little less and it did not give me time to rectify. I have to admit I was annoyed from that day, but seeing that someone has won the forum and especially you like the 24h and that Nick in Spanish, I have felt good. You already know that I like many your watches 24h bostok, I take the opportunity to show the last two that I have bought, just a few days after the messages that we cross. elsoldemayo, Neruda and kev80e like this. Now the waiting game begins for shipping! Last edited by Beau M; October 27th, 2017 at 19:38.
elsoldemayo, Neruda, armanh and 2 others like this. Very nice. I must try find the one on the left sometime. The one on the right I have the same dial but different bezel. elsoldemayo, bpmurray, DJW GB and 10 others like this. bought a month ago, but just arrived a few days ago and i finally got around to bringing it out to slap a band on it. rather convinced the dial's restored (decently high chance, considering the seller's rep) and the crown's replaced, but the movement is sound and i've been looking for a pobeda for a while... what do y'all think? Pic isn't showing flenr. Try posting again but use the Go Advanced option. Site is having a recurrence of a picture issue that crops up now and then. Neruda and JonS1967 like this. Can see the pic now. Will leave it to more knowledgeable contributors to comment on it's authenticity or you could post in the Franken QA thread. Real or fake, it's a nice looking watch. Got myself all worked up to get a military issue 6e4-1 to round off my ratnik collection when I saw this. 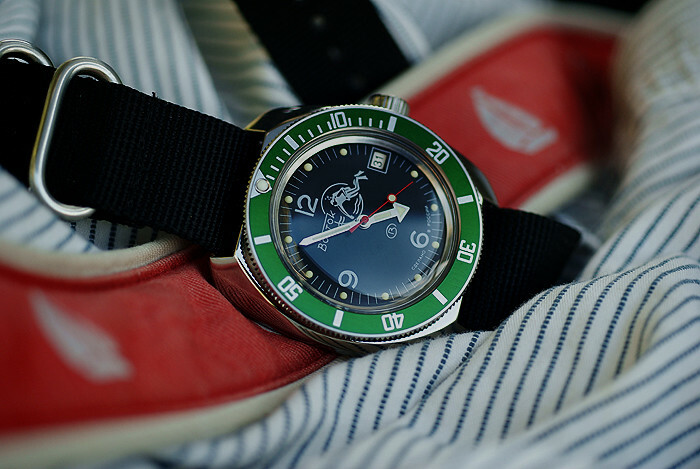 Vostok 2416b with a unidirectional click bezel! I passed up the chance to get a Generalskie with a click bezel a while back, not knowing it was uncommon, so I went for it. Horribly overpaid for a 2416b but it's pretty and I like the idea of a clicky vostok. Just won't be making any watch purchases for a little while! Last edited by do_checkdate; October 31st, 2017 at 22:04. Sansoni7, elsoldemayo and JonS1967 like this.